Six Little Hearts: Ella's Kitchen Review and GIVEAWAY! Ella's Kitchen Review and GIVEAWAY! I like homemade baby foods. They are best for giving your baby all the good stuff for growth and development. They are inexpensive, quick to prepare and give them the best start. You don't need to be told that really. Recently I was outside with my little Miss in the bright sunshine and noticed that she was a lovely shade of orange! This is due to her love of my pumpkin and carrot based creations. I am slightly mortified that she has become a shade resembling my meals. She looks as if she is sporting a cheap fake tanning product. Time to branch out and try some new foods I think! Ella's Kitchen make delicious, natural baby foods just like Mums make. The only difference really, is that Ella's Kitchen meals were actually made by her Dad! 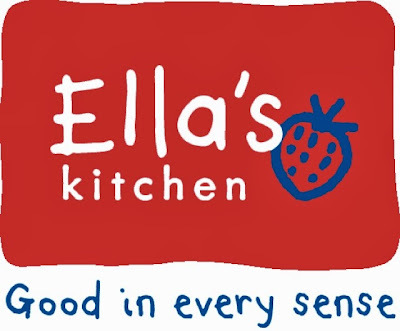 Ella's Dad, (Paul Lindley), began Ella's Kitchen because he believed all children should have the opportunity to enjoy healthy foods that not only taste good but are enticingly fun to eat too. The range is presented in fun, squishy pouches with twist off and resealable tops. Small children can handle them on their own and slurp them straight from the packs. Great for that pesky independent streak! 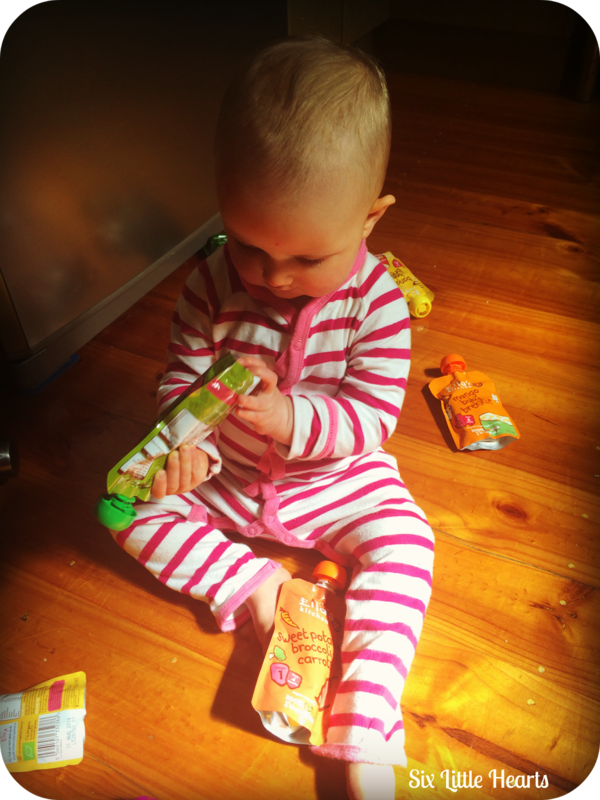 Alternatively squirt portions straight onto the spoon for younger babies to prevent wastage. Ella's Kitchen is basically as good as it gets for us time-poor Mums who sometimes always need a helping hand. It's a guilt-free, simple way to get the goodies into your child while juggling a million other pressing demands. I found the pouches to be enormously convenient to carry anywhere. Great to pop into the nappy bag or handbag without taking up too much space or adding weight (and worry) like glass jars. Sweet Potatoes, Broccoli and Carrots. Then there's the yummy extras like Banana Baby Brekkie (smooth fruit yoghurt and rice) and even smoothies like The Purple One (squished smoothie fruits). The pouches can be consumed on their own or mixed with your own choices such as baby rice or even blended with your own cooking to tailor foods suitable to your baby's age and stage. 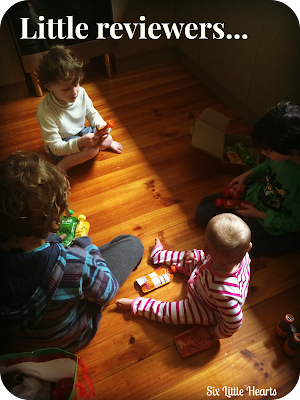 While I was photographing the products, my older kids got all excited and asked if they could eat them too! Apparently kids at school have these in their lunchboxes. Now there's an idea! Miss Celeste was suitably impressed. She had no problems with eating anything from Ella's Kitchen and going by the number of empty bowls I washed, I can only presume she really liked the products. I am hoping in the coming months, with the introduction of this range's variety in her diet, she will change to a more natural colouring. Better stick to the green pouches for a while! The Ella's Kitchen range is available at Coles supermarkets Australia-wide. 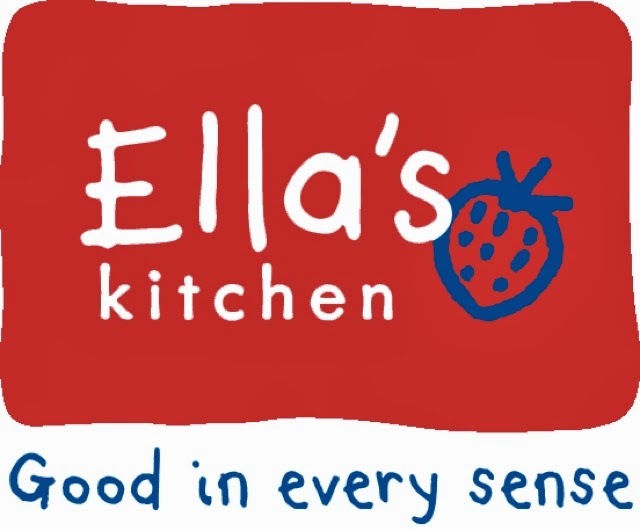 You can learn more about Ella's Kitchen on their website here. Or why not follow Ella's Kitchen on Facebook for up to the minute updates on their exciting products. 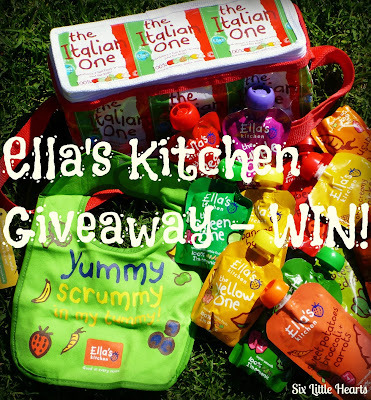 Thanks to the generosity of Ella's Kitchen, one lucky Six Little Hearts reader has a chance to win an Upcycled Ella's Kitchen Pouch filled with Ella's Kitchen goodies for their little one/s to enjoy! Please share this competition with your Mummy friends! Winner will be notified by email and given 48 hours to respond. Please note: Your entry is only valid if you complete the mandatory requirements of this competition (there are two of them). If you do not complete these mandatory entry requirements then all your subsequent entries will be invalid and removed. Please play fair as others do take the time to complete their entries! All entries will be screened to ensure they conform to these requirements. Please follow Six Little Hearts on either Facebook, Twitter, Pinterest, Instagram or Bloglovin' or subscribe by email or RSS Feeds to receive my latest updates on new posts, reviews and competitions. 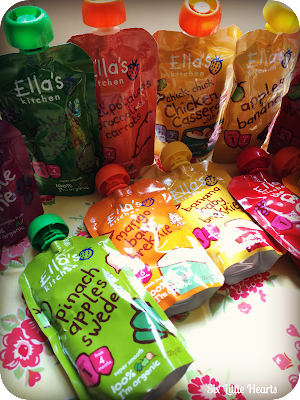 Ella's Kitchen provided me with a selection of products to try for review. I feel the kids will love the recipes where there is sweetness from the fruits or the vegetables in the overall flavour. They will love carrots & sweet potato based purees. Moreover apple ,pear,banana and mango either alone or in combination with other fruits or vegetables will be welcomed by them. 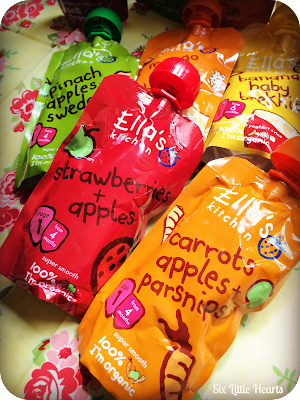 My little guy is a big fan of sweet potato - he loves this mixed with sweet/savoury combinations. A current favourite we made from grandad's garden was sweet potato, green beans, beetroot and some cheese. We made a big person salad version (which wasn't pureed) with some cous cous too - delish! Any combination with apple in it for sweetness is a certain hit! My son grew up eating food prepared by me (even though I hate cooking!). I cannot believe the variety of baby/toddler foods available now and the amount of take away food that is fed to kids. There's a lot to be said about home cooking isn't there? 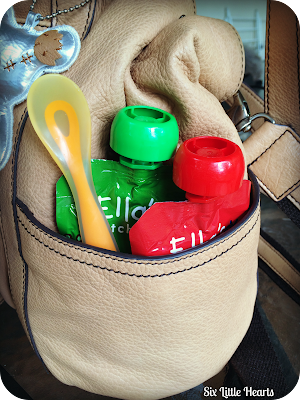 I love Ella's Kitchen stuff for my toddler. I have them in the cupboard as treats and for when we are out and about and she is getting hungry and I don't have cash to buy something, or when she is heading towards a major public meltdown and I need something to distract her. They work a treat. I also use the veggie ones when we've had a week of being out and about and eating lots of crappy food while away so I know that she is at least getting some veggies in to her. I have even started giving the baby a few spoonfulls of whatever is leftover after Punky is done (which isn't much, but is enough to satisfy Zee's current food curiosity). I found they loved the sweetness in food wether it be a savoury or sweet dish made from fruit or vegetables. Pumpkin, Brocolli, Sweet Potato & Veal! Potato and Pumpkin with a smidge of vegemite. I regualrly serve a chicken and sweetcorn soup that is loved by everyone so I am certain chicken, sweetcorn and potato would be a favourite. 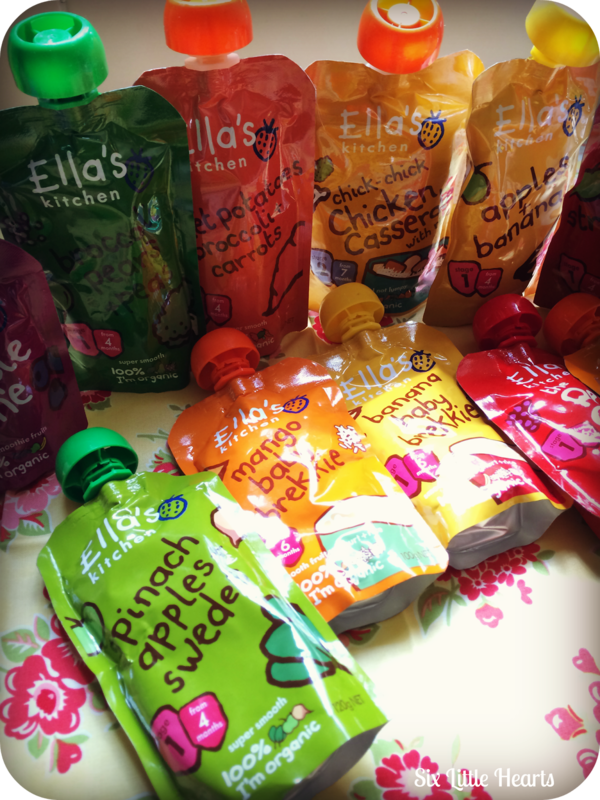 I am interested in Ella's Kitchen other products as they are an easy way to introduce new foods and flavours. What a god send these meals are! I think any foods made into different shapes and displayed well can be a winner!! Banana and strawberry: always a winner! Kids love sweet items, as this is not good for them try them on all kinds of fresh and stewed fruits. My kids have all loved eating fresh home cooked meals rather than store bought ready made jars which was fine by me as the sugar and salt contents in them were sky high. They loved pureed apples and their custards so I used to regularly make them an apple crumble and custard for dessert...was always a winner. Banana, kale and apple puree. CityHooks and CityGrips A Review and GIVEAWAY!